The images that you choose for your email marketing campaigns can make or break it. Too large or too many images can cause your copy to be lost in the shuffle. Not enough or weak images make your campaigns look drab. There is a happy medium somewhere in there. Another concern is making sure your images have the meaning you intended. 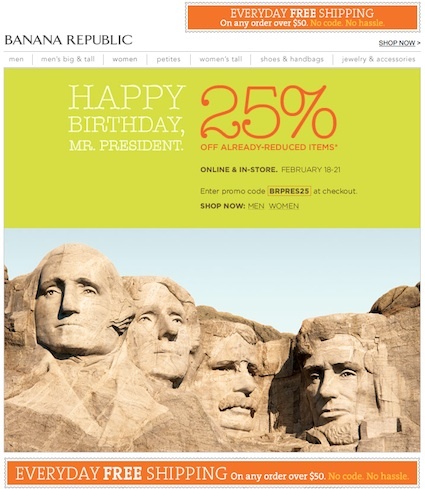 I received a Presidents Day email campaign from Banana Republic this week that I am kind of on the fence about. It’s a pretty simple design that displays all the information it needs. It’s two tiered. At the top it reads “Happy Birthday, Mr. President” and has their Presidents Day sale details. The bottom half of the email is a photograph of Mt. Rushmore. This is what I’m torn on. I can’t decide if I like it or don’t like it. What about a photo of this mammoth rock sculpture screams buying clothes at Banana Republic? Would they have been better served using images of their clothing? It is a sale that has specific items being discounted. Perhaps photos of those products would inspire more sales. The other thought I had on it was a little campy. I thought it would be funny if they had all four presidents wearing some sort of Banana Republic item, like hats, ties or scarves. Sure this would tie in the theme of the holiday with their product; on the flip side of that, some might find it offensive that you were desecrating a national monument. Maybe if they would have used models and Photoshop and made it resemble Mt. Rushmore that issue could be avoided. All in all, it wasn’t a bad campaign. The sale information was good and it was easy to figure out what the deals were. The copy was fine and to the point. The images were bright and bring about that Patriotic sense of pride. When sending your email campaigns, it is important to determine all the ways your images can be interpreted. Some may react favorably, but it is also possible that some react negatively. Knowing how your full audience will respond is an integral step in creating successful email marketing campaigns. Remember, it’s not too late to customize your own Presidents Day Email Template for February 21!